On Apr. 5 I went on a short hike along the Wildflower Greenway behind the Garden Apartments in Oak Ridge. 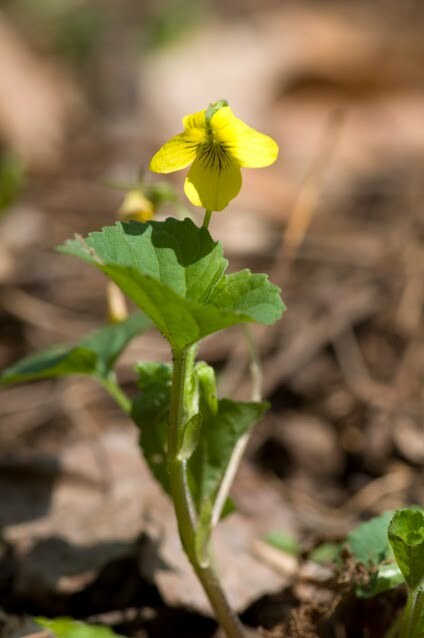 This north-facing trail has lots of wildflowers. 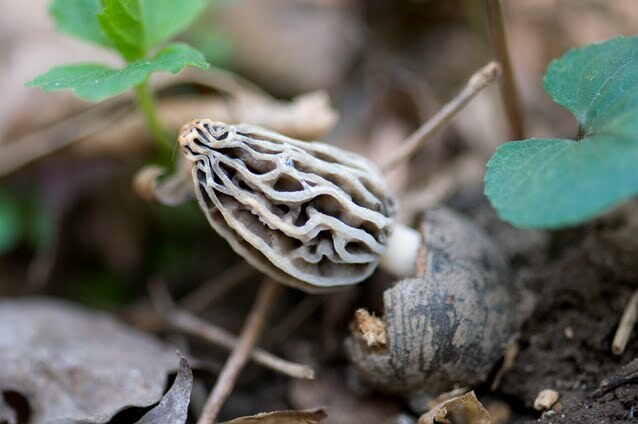 I was excited to find this Morel mushroom, I've heard they are really good to eat, but I would never eat any kind of fungus out of the wild without an expert's opinion! owers on their own stalks. 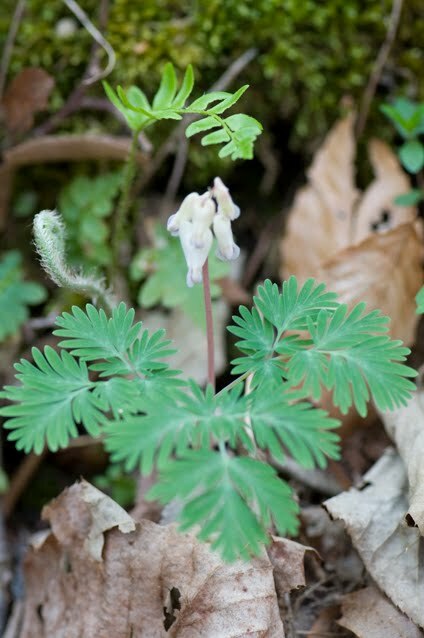 A little farther down the trail I spotted one of my favorite spring wildflowers, Squirrel Corn, a relative of the Dutchman's Breeches! 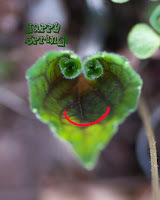 This plant is also related to Wild Bleeding Heart, which is larger and has pink flowers. I'd like to go back next week and see if more of them are in bloom. 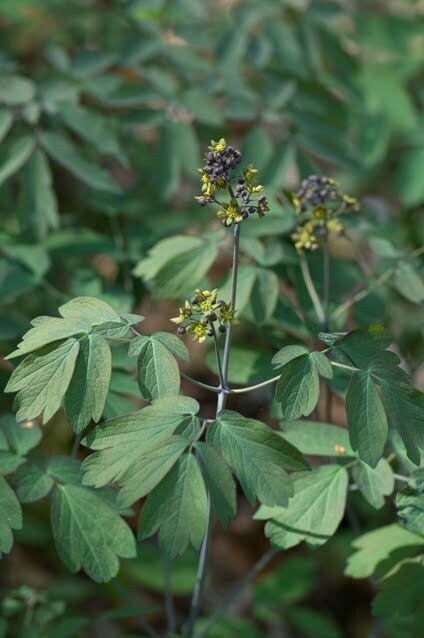 Another plant that was blooming on the other side of the creek was the Blue Cohosh ( a.k.a "Electric Lightbulb Plant"). The flowers are an olive color and not especially interesting, but the berries that form in the fall do look like little blue lightbulbs. 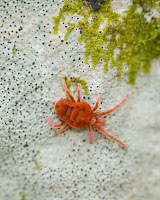 One of the few critters I spotted along the trail was the Velvet Mite. I always enjoy seeing them, they are so colorful! They are difficult to photograph because they seldom stop moving! On Wed. morning I met Morgan Simmons and Amy Smotherman, the Lifestyle reporter and photographer from the Knoxville Sentinel newspaper at Haw Ridge. We had a fun and interesting 2-1/2 hour, 2-mile hike around the peninsula. 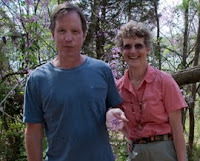 I told Morgan that Redbud flowers are edible (and actually taste good! ), so he sampled a few --- that was all it took, he was hooked! I got tickled every time he passed a tree, he picked a few flowers and munched on them. 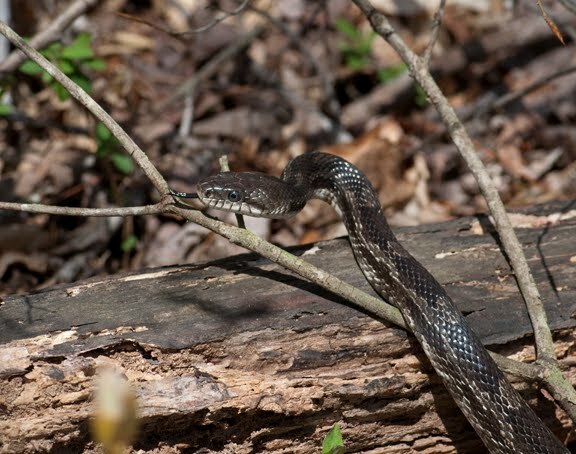 :) Our m ost exciting event of the day was when we spotted a 5' Black Rat snake climbing a cedar tree. One of the interesting flowers we saw was Hoary Puccoon. The article will run in the paper this coming Sunday or Monday. After the hike I went to Melton Lake and the Oak Ridge Marina. I was amazed as I watched a hawk fly by with a snake in its talons! Unfortunately, it happened so fast I couldn't react and tak e a picture! 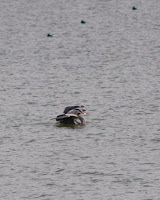 :( Later I watched a Great Blue Heron land in the middle of the lake several times to catch fish. That was the first time I'd ever seen one do that, they are normally wading birds. Happy Easter! 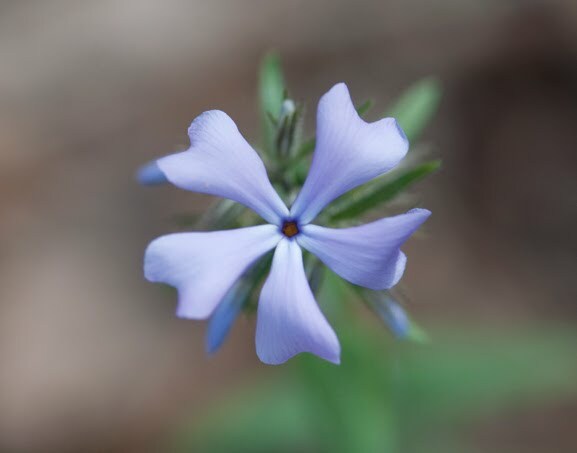 Here is a pretty, cross-shaped flower for the special day! I hope everyone who celebrates the holiday had a wonderful day! 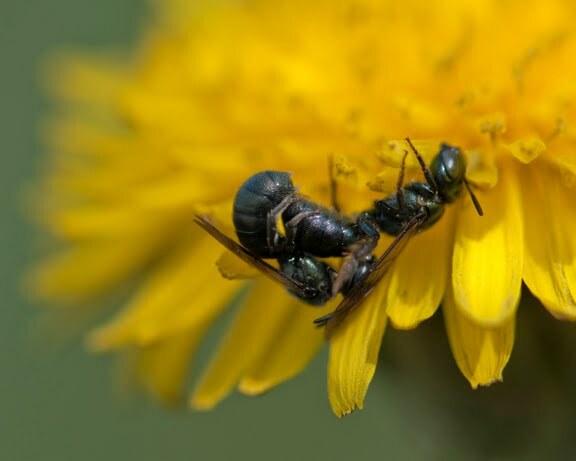 I had not even made it out of the parking lot before I spotted some "action" happening on a dandelion. Upon closer inspection, I realized I was intruding on an "intimate moment" between two wasps! I guess this isn't too risque to post on here! ;) The male is on the left. Farther down the trail I saw so me wildflowers that had not been blooming when I visited last week. The Blue Phlox (left) was just beginning to open on the north side of the ridge. 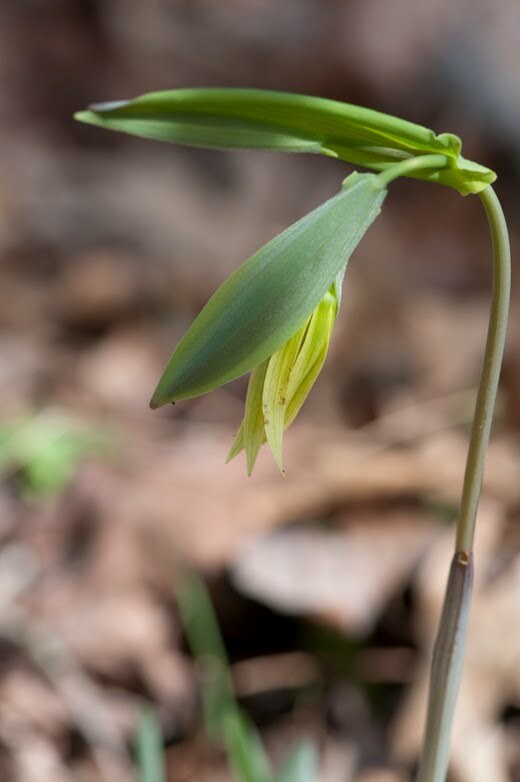 Later, down another trail I saw a coup le of Perfoliate Bellwort (right) with its yellow "tutu" flowers. 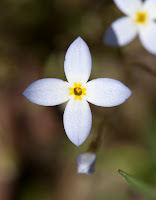 This is a very common flower in our area. 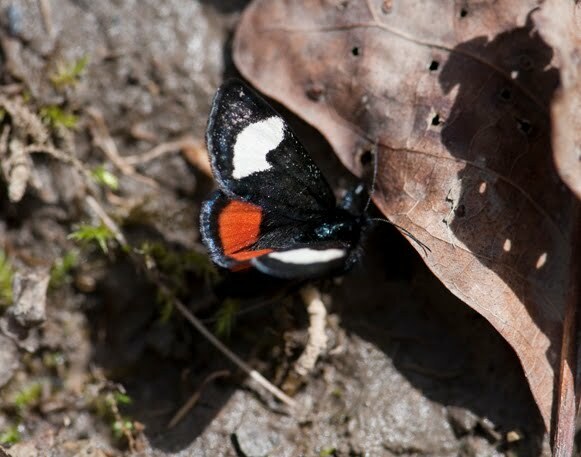 A small black moth with large wh ite and red spots on its wings flitted along the trail and finally landed long enough for me to snap a picture. I looked it up when I got home and learned it is a Grapevine Epimenis, a species of the Forester Moth group. The bold color patterns makes me think it is probably distasteful. There were several drab, brown moths and a few butterflies that were not as cooperative for a photo. 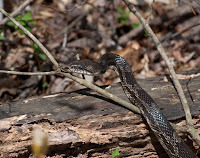 We had a couple of trail bike riders tell us that they had seen a large snake near the picnic tables farther down t he trail. Just as I was getting ready to eat my sandwich, a rider went by us, slowed down and then came to a stop. He said excitedly, "There's a large snake over here!" That was all I needed to hear! I put my sandwich back in the box, grabbed my camera and went over to see it. 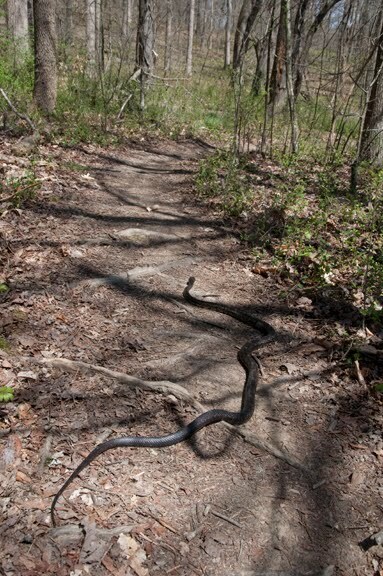 It was a large Black Rat Snake, about 4 feet long. He was busy hunting and didn't pay us much attention. Things got really interesting when the snake decided to slither between Kenny's feet! Fortunately, he neither of us is freaked out by snakes! The noise in the background on the video is a boat, we were next to the lake. As usual, we got turned around on a couple of the trails, making our hike a little longer than we'd planned. As many times as we have hiked there, we always ha ve trouble with the trails on the east end. When we finally got on the Middle Road trail we knew we were OK. 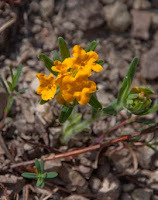 I wanted to hike back on Saddle, it is a moderate trail that follows a spring-fed stream, it always has lots of wildflowers. 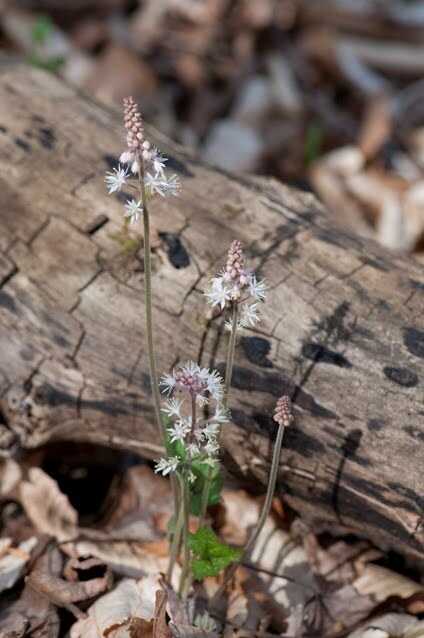 This time I saw my first Foamflower (left) of the year on that trail. 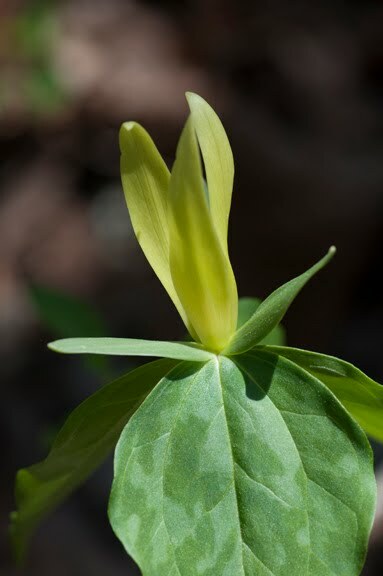 The fragrant Lemon Trillium was just beginning to bloom too. Be sure and take the time to smell the flowers if you come across them, they smell like lemons!